Both the flow of air traffic, and air traffic control communication, is interesting to observe - especially during rush hour! You can listen to live air traffic control (ATC) radio communication of many airports around the world, via the internet. These live audio feeds are also good for student pilots: get used to standard phraseology of ground control, tower, etc., at various speeds. As my first flight instructor used to say: "radio work is have the job! ", especially in a busy corridor of the USA. 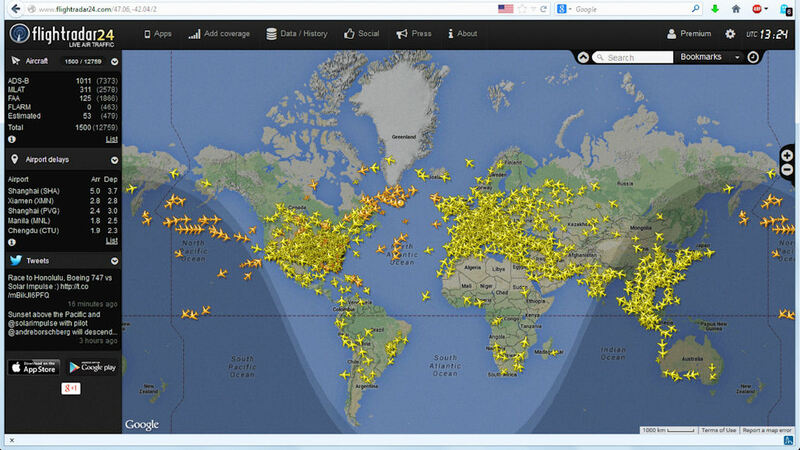 Likewise, much of the world's air traffic (in particular airline flights) can also be tracked in real-time on a map. On average, over 5000 airplanes are in the skies over the USA at any given time (source: NATCA). Links to ATC audio and flight tracking websites are listed below. The following website provides (near) real-time tracking of thousands of flights around the world, both of airlines and of "private" aircraft equipped with ADS-B. You can zoom-in on the map, filter on airline name and aircraft type, see the flight track & profile since take-off of the selected aircraft, etc. Coverage outside the USA and Europe is still limited, due to the small number of (accessible) ground-based ADS-B responders in outside those areas. It is fascinating to see the amount of traffic "pulsate" between the continents, as the day-night cycle progresses. 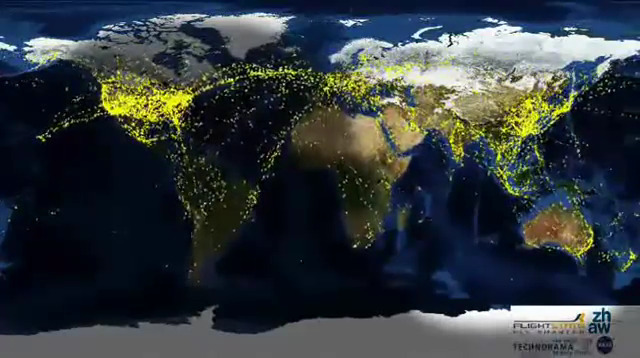 The clip below shows a 24 hour time-lapse of air traffic around the world, compressed into about one minute! In the skies over the USA, there are 80-100 thousand flights every day! Only about 30% are commercial flights (large & regional airlines), another 30% is general aviation (private airplanes), another 30% are air taxi flights (planes for hire, charters), and the remaining 10% are cargo and military flights. Your browser does not support HTML5 video. Use your own player with this .mp4, .webm, or .ogvvideo file. VHF radio communication has limited range. 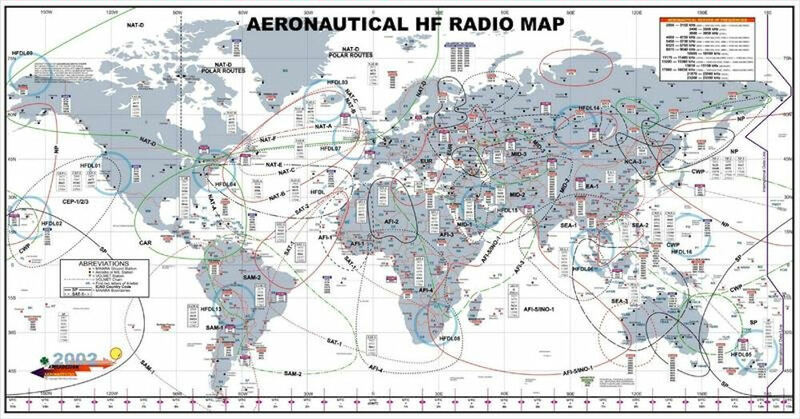 Large areas of the world do not have VHF coverage for air traffic control radio communication - either because they are too far from land (i.e., the oceans), or because they are remote and the controlling countries can not provide coverage for economic reasons. To compensate for this lack of VHF coverage, a number of Major World Air Route Areas (MWARAs) were established around the world. For flights along these routes, air/ground communication is done via shortwave radio, on aviation-specific HF frequencies (3 - 30 MHz) with Single Side-Band (SSB) modulation. For starters, you may want to try 5598, 5616, 5649, 8825, and 13306 kHz (USB). These North Atlantic frequencies are typically busy around 05:00 GMT. Note: the list below has not been verified, and is not kept up-to-date! It is not to be used for any purpose other than personal monitoring.